Endolymphatic sac tumors (ELSTs) are rare, low-grade papillary epithelial neoplasms (adenocarcinomas). They are slow-growing and locally aggressive in nature resulting in late clinical manifestations with expansive mass invading the temporal bone and posterior fossa. The first reported case of ELST was in 1984, but it is in 1989 that Heffner characterized ELST as a tumor deriving from the endolymphatic sac epithelium of the internal ear, referring to it as a “low-grade adenocarcinoma.” ELSTs usually occur sporadically, although some arise in association with the von Hippel–Lindau disease (VHL), a rare genetic disorder caused by a mutation of the chromosome 3 (3p25-26). 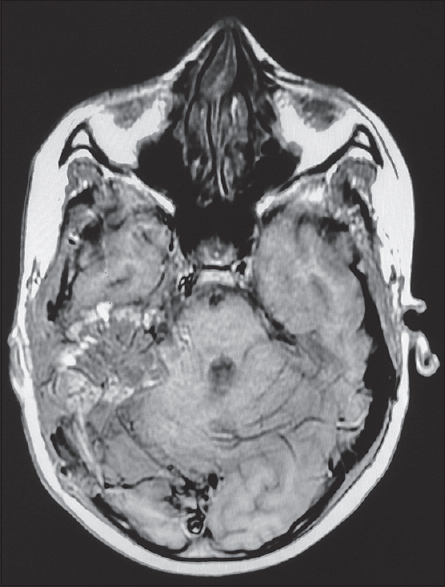 Here, we present a case of ELST associated with VHL disease in a 14-year adolescent. An otherwise well, 14-year-old girl presented with the progressive right-sided hearing loss for 1 year, protruding reddish mass from right ear, and incomplete closure of right eye for 5 months. Complete general and neurological examination revealed right-sided profound sensorineural hearing loss, right facial nerve palsy (lower motor neuron type), impaired right corneal reflex, and sensory loss over right trigeminal nerve distribution (V1–V3). Neither the symptoms nor a family history of VHL disease were found in the patient. Magnetic resonance imaging (MRI) brain showed a large heterogeneously enhancing lobulated lesion in the petrous region of right temporal bone, which is heterogeneously hyperintense on T2/fluid-attenuated inversion recovery and iso- to hypo-intense on T1 with areas of intervening hyperintensity. Extension of lesion was noted in right external auditory meatus and middle ear. Mass effect was also seen on the right cerebellar region and right middle cerebellar peduncle displacing it toward left with mild compression of the fourth ventricle [Figure 1]. Subtotal excision of tumor was done after embolization of tumor bed. 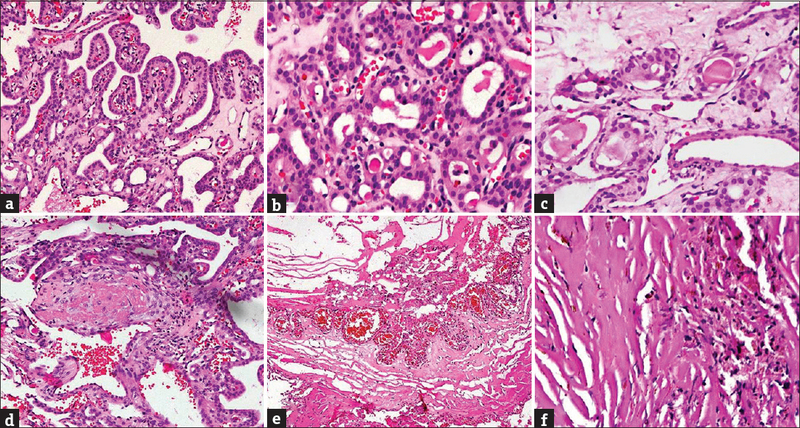 Histopathologic features were consistent with endolymphatic sac papillary tumor [Figure 2]. Tumor cells were immunopositive for cytokeration, epithelial membrane antigen (EMA) and S100 and negative for synaptophysin, chromogranin, and glial fibrillar acid protein (GFAP) [Figure 3]. Molecular testing for VHL gene revealed heterozygous missense pathogenic variation c.563T>C in VHL gene which is consistent with the diagnosis of VHL disease. Diagnostic tests for VHL disease including a fundoscopy to rule out retinal hemangiomas, computed tomography (CT) of abdomen to exclude liver or adrenal tumors, serum tumor markers for neuroendocrine tumors, MRI of the spine (to locate any angiomatous lesions) were performed and no abnormalities were detected. 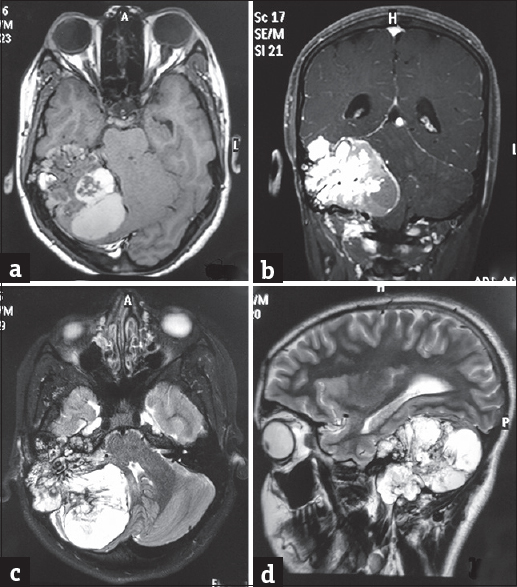 Postoperative contrast-enhanced CT brain revealed residual tumor [Figure 4], so she was planned for adjuvant radiotherapy. In view of young age of the patient with unilateral deafness and close vicinity of the residual tumor to the critical structures, it was important to minimize the dose to opposite cochlea and brain stem. She was prescribed a dose of 5220 cGy in 29 fractions over 6 weeks by three-dimensional conformal radiotherapy. Maximum dose received by brain stem was 5290 cGy and opposite cochlea received mean dose of 3830 cGy which were within tolerable limits. She completed treatment without any complications. 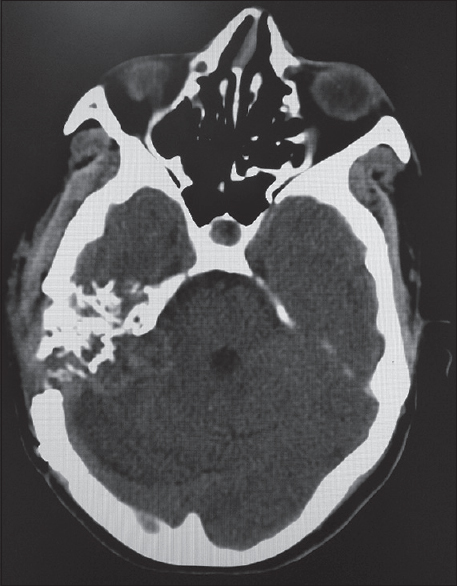 She was then followed up first at the end of 1 month with CT brain [Figure 5] when she had significant improvement of symptoms. ELSTs have been known as individual tumour entities since 1984. ELSTs may occur as solitarily and sporadically or as a hereditary manifestation associated with VHL disease. There is an abnormal growth of multiple tumors in various parts of the body such as liver, lung, brain, kidney, pancreas, and adrenal gland in VHL disease. However, none of these tumors were found in our patient. ELSTs associated with a diagnosis of VHL disease appear to affect a younger population and women twice as often as in men as is seen in our case. It is more frequently bilateral and advanced as opposed to the non-VHL disease patient. Patients characteristically present with unilateral sensorineural hearing loss, tinnitus, otalgia, otorrhea, vertigo, ataxia, and facial nerve paresis. Large tumors growing along the posteromedial vector may cause symptoms secondary to cerebellopontine angle invasion. An indolent clinical course and long-standing symptoms are typical. As the symptoms may mimic those of Meniere's disease, radiologic imaging, and histopathology are essential for the diagnosis. Metastases from ELST are very rare. The imaging hallmark of ELST is the presence of a retrolabyrinthine mass associated with osseous erosion. CT demonstrates an expansile lytic lesion of the retrolabyrinthine and mastoid process of the petrous bone, which may extend to involve the posterior fossa and middle ear. On MRI, the ELSTs usually have a heterogeneous appearance. It shows the core of the tumor as isointense with brain on both the T1- and T2weighted images with a slight enhancement after intravenous gadolinium. Multiple high-signal intensity foci on both T1- and T2-weighted images indicate the presence of blood-, methemoglobin-, or proteinaceous-filled cysts or cholesterol clefs. Such blood products are rare in other temporal bone lesions. ELSTs are papillary adenocarcinomas of low histologic grade. It typically stains positive for cytokeratins, EMA, vimentin, and periodic acid–Schiff, while detection of S100 protein and/or neural-related antigens such as synaptophysin and GFAP is variable. ELST does not show reactivity for calponin and calretinin. In our case, tumor cells showed immunopositivity for cytokeration, EMA, and S100 and were negative for synaptophysin, chromogranin, and GFAP. Early surgical excision is the best treatment when the tumor is small and remission may last for years. When the tumor is large, complete excision could be unachievable because of vigorous tumor bleeding and encasement of cranial nerves. In this presented case also, owing to heavy bleeding, a staged surgery was performed where resection of tumor was done following embolization of tumor bed. The effectiveness of radiotherapy for the management of ELST is controversial., However, no evidence of tumor activity or disease progression was observed during 1–8 years after postoperative radiotherapy of 50–56 Gy or stereotactic radiosurgery of 14 Gy. In our case, adjuvant radiotherapy was advocated to achieve tumor regression and to preserve the integrity of surrounding vital structures as complete resection was not possible and also because the patient was quite young. We present this rare case to contribute in part to the better understanding and awareness of this extremely rare malignancy. A multidisciplinary treatment approach including neurosurgeons, radiologists, neuropathologists, and radiation oncologists should be provided to patients with ELST to achieve adequate control of these locally aggressive tumors. The authors would like to thank Dr Kausik Mandal (Department of Medical Genetics, Sanjay Gandhi Postgraduate Institute of Medical Sciences, Lucknow, India) and Dr Madhulika Kabra (Department of Medical Genetics, All India Institute of Medical Sciences, New Delhi, India) for their help in the genetic testing of the patient. Hassard AD, Boudreau SF, Cron CC. Adenoma of the endolymphatic sac. J Otolaryngol 1984;13:213-6. Heffner DK. Low-grade adenocarcinoma of probable endolymphatic sac origin A clinicopathologic study of 20 cases. Cancer 1989;64:2292-302. Maher ER, Kaelin WG Jr. Von hippel-lindau disease. Medicine (Baltimore) 1997;76:381-91. Megerian CA, McKenna MJ, Nuss RC, Maniglia AJ, Ojemann RG, Pilch BZ, et al. Endolymphatic sac tumors: Histopathologic confirmation, clinical characterization, and implication in von Hippel-Lindau disease. Laryngoscope 1995;105:801-8. Muzumdar DP, Goel A, Fattepurkar S, Goel N. Endolymphatic sac carcinoma of the right petrous bone in von Hippel-Lindau disease. J Clin Neurosci 2006;13:471-4. Ho VT, Rao VM, Doan HT, Mikaelian DO. Low-grade adenocarcinoma of probable endolymphatic sac origin: CT and MR appearance. AJNR Am J Neuroradiol 1996;17:168-70. Valvassori GE, Becker M, Mafee M. Imaging of the Head and Neck. New York, USA: Thieme; 2004. Kempermann G, Neumann HP, Volk B. Endolymphatic sac tumours. Histopathology 1998;33:2-10. Mukherji SK, Albernaz VS, Lo WW, Gaffey MJ, Megerian CA, Feghali JG, et al. Papillary endolymphatic sac tumors: CT, MR imaging, and angiographic findings in 20 patients. Radiology 1997;202:801-8. Gaffey MJ, Mills SE, Fechner RE, Intemann SR, Wick MR. Aggressive papillary middle-ear tumor. A clinicopathologic entity distinct from middle-ear adenoma. Am J Surg Pathol 1988;12:790-7.